This striking elegant pendant reproduces the delicate profile of a woman wearing stylised headgear typical of the traditional costume of Cagliari. 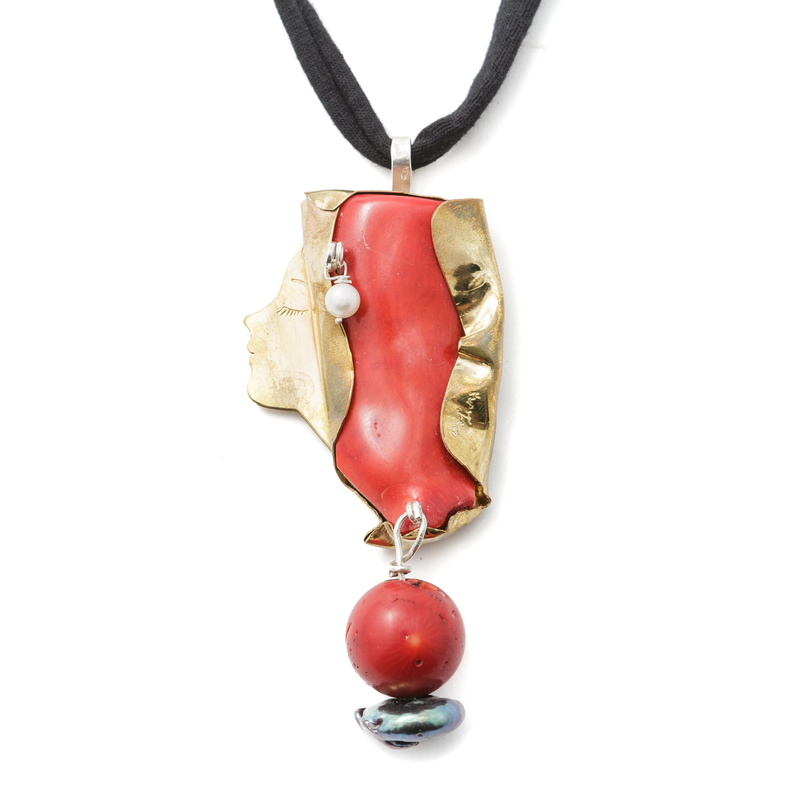 Made of Indian coral, pinchbeck, mother-of-pearl and pearls, it expresses the distinctive dreamy style of this goldsmith’s workshop. 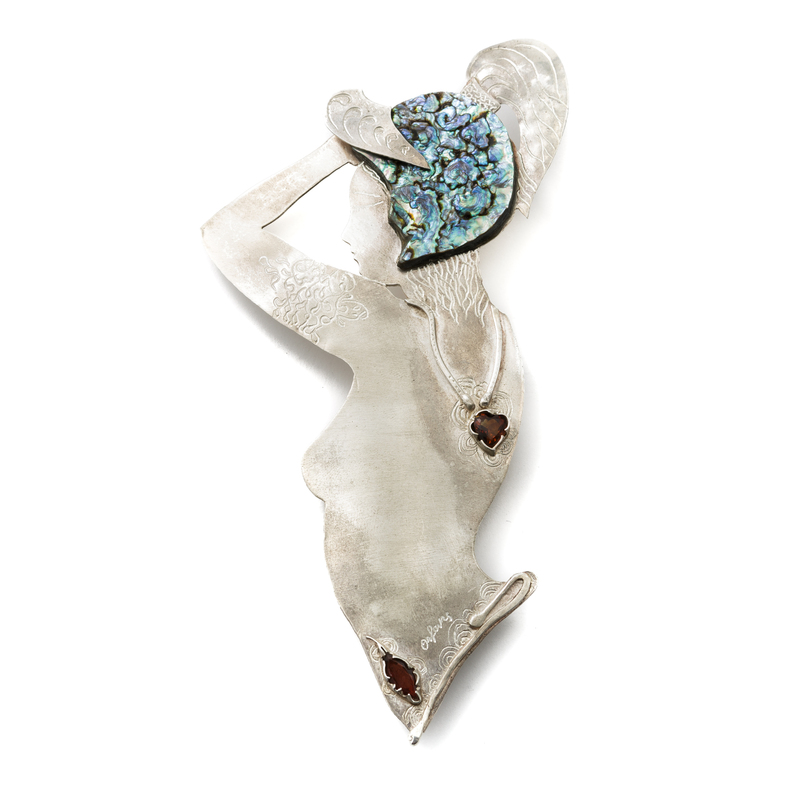 With the pride of the figures of the archaic Greek vases, the warrior woman represented in this large brooch is finely crafted with originality and oneiric style, distinctive of this goldsmith’s workshop. Elegant and lush, the Bird of Paradise displays its indisputable beauty in this large handmade silver, mother of pearl, quartz and tourmaline brooch. 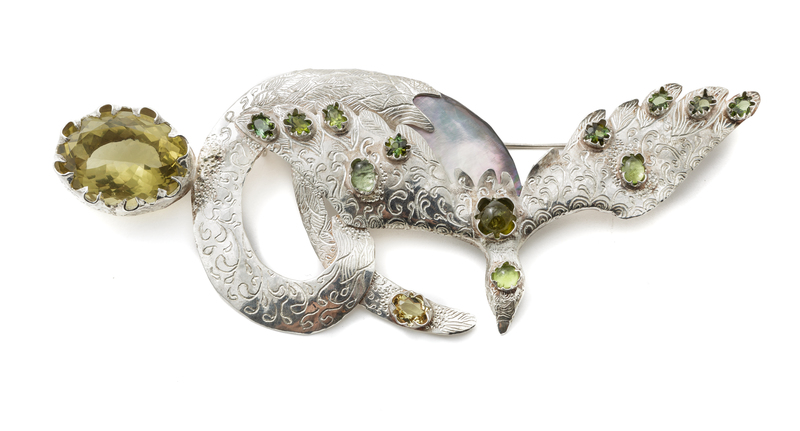 Characterised by the oneiric style typical of this workshop, the brooch is part of the evocative animal series. These striking elegant pendants depict the delicate profiles of two women wearing the stylised headgear typical of the traditional costume of Cagliari. 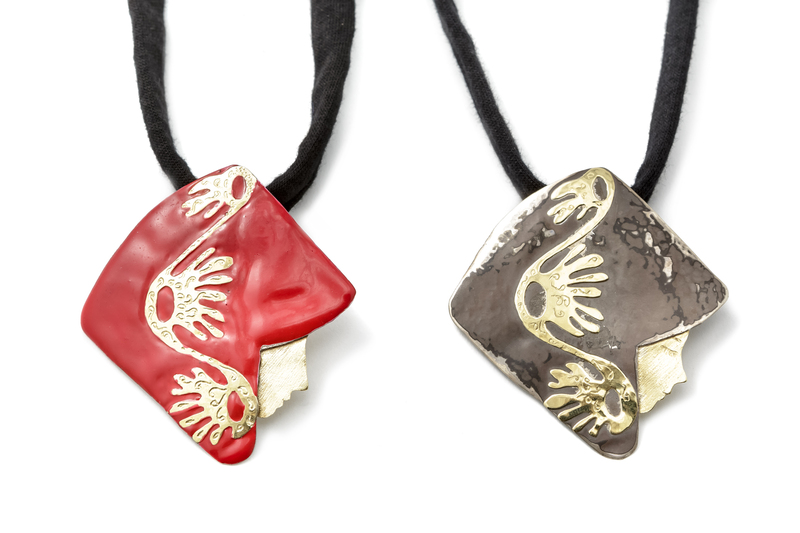 In silver and gold, these refined pendants express the distinctive oneiric style of this goldsmith’s workshop. The delicate profile of a woman wearing a headscarf with her eyes shut characterises this necklace made with artistic and sculptural technique. Made in silver, pinchbeck, semi-precious stones and pearls, it fully expresses the distinctive dreamy style of this goldsmith’s workshop. The production of the Orfevre goldsmith’s workshop elegantly describes a magical world, which evokes the nature of the island and its ancient traditions through the use of a fine symbolism apparently suspended in an intimate timeless narrative. The workshop, which carries on a family tradition, was set up in Nuoro in 1980 by will of Maria Conte. Maria graduated as Art Teacher at the State School of Art in Nuoro, then she specialised at DAMS in Bologna. Her creations stand out from the local scenario thanks to their distinctive and recognisable style. During the years dedicated to her work, her creative journey fascinated and involved, albeit in different ways, her three children Rosella, Rocco and Emanuela. They have all followed their own path and training and now contribute to the success of the workshop. Orfevre jewellery is promoted in personal and collective, national and international exhibitions, in fashion and jewellery shows in Florence, Rome, Milan, Dubai, London, Berlin, Tunis, Perth, Munich where it was awarded the Exempla International Award for young designers. In 2009 it also received the Navicella d’Argento award for having brought prestige to Sardinia both at a national and international level. 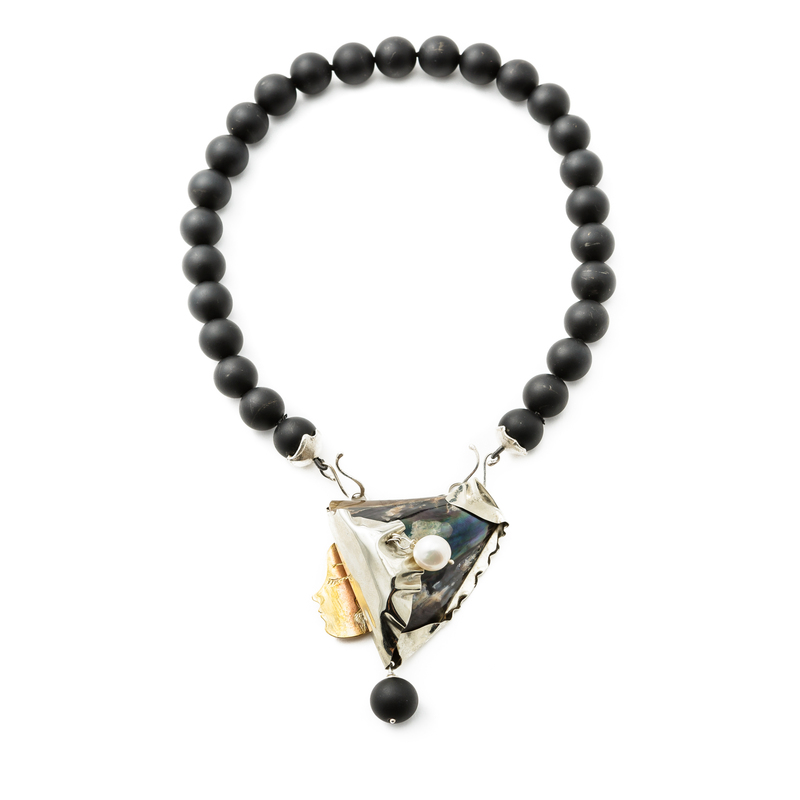 This jewellery production is characterised by the complex sculptural technique of gemstone-cutting and the working of precious metals. Starting from the raw material, which is crafted in order to faithfully reproduce the design sought, the gold and silver plates are hand-shaped, combined with seashells, mineral stones, coral and pearls, which enrich these creations with echoes of ancient talismans with apotropaic powers. The Donne (women) and Animali (animals) lines are the recurring themes, and one-off custom made items are also produced on the clientele’s demand. Metal is plate-shaped, then gemstones are set and engraving, embossing and chiselling are performed.